Not to be confused with Socorro. This article is about the Mediterranean wind. For other uses, see Sirocco (disambiguation) and Jugo (disambiguation). Sirocco (/sɪˈrɒkoʊ/), scirocco, jugo or, rarely, siroc (Catalan: Xaloc; Sicilian: Sciroccu; Greek: Σορόκος; Italian: Scirocco; Spanish: Siroco; Maltese: Xlokk; Occitan: Siròc, Eisseròc; Croatian: Jugo, literally southerly; Libyan Arabic: Ghibli; Egypt: khamsin; Tunisia: ch'hilli) is a Mediterranean wind that comes from the Sahara and can reach hurricane speeds in North Africa and Southern Europe, especially during the summer season. 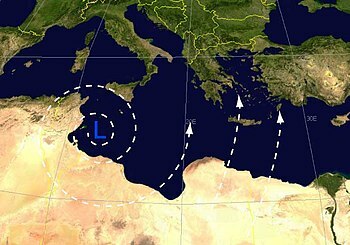 The sirocco causes dusty dry conditions along the northern coast of Africa, storms in the Mediterranean Sea, and cool wet weather in Europe. The sirocco's duration may be as short as half a day or may last several days. While passing over the Mediterranean Sea, the sirocco picks up moisture; this results in rainfall in the southern part of Italy, known locally as "blood rain" due to the red sand mixed with the falling rain. Many people attribute health problems to the sirocco, either because of the heat and dust along the African coastal regions, or because of the cool dampness in Europe. The dust within the sirocco winds can cause abrasion in mechanical devices and penetrate buildings. Sirocco winds with speeds of up to 100 kilometres per hour (54 knots) are most common during autumn and spring. They reach a peak in March and in November when it is very hot. When combined with a rising tide, the sirocco can cause the acqua alta phenomenon in the Venetian Lagoon. ^ Golden Gate Weather Services. Names of Winds. Retrieved on 2006-12-28. Wikimedia Commons has media related to Sirocco (wind). "Sirocco" . Encyclopædia Britannica (11th ed.). 1911.